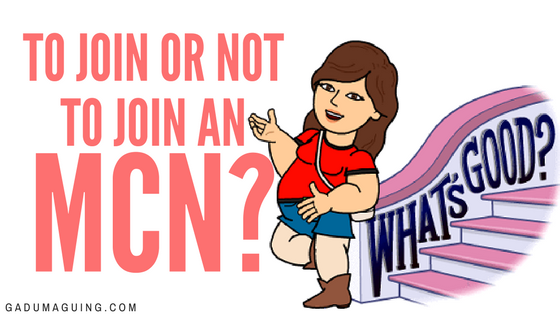 To Join or Not to Join a MCN? I’ve been now vlogging for a year, few more months to go I’m almost on my second year. I know, I didn’t grow my YouTube channel much, not like others out there that in a matter of few months they’re like ten of thousands subscribers already. A MCN or Multi Channel Network that said to be helping video creators on YouTube like me in building and growing their channel approached me, there are actually 3 of them, 1 is a so-so southest asia MCN and 2 huge MCN which at the same time an entertainment company. Possibly they saw the potential or maybe they just want to grow their number of creators on their MCN but they did gave an offer. Sadly, since the documents (I believe) they sent to be are private I choose not to publish and share it but hopefully I’ll be able to give you an idea along the way in this post. But if you ask, why should you, a video creator on YouTube should think about joining a MCN? These MCNs can help you promote your channel. They did not specify though if they’ll be making ads, but they do mention that they’ll help you promote it - maybe through their TV network, or existing huge video creators. The MCNs like these have these known video creators already, and since you’ll be getting to know these creators, you can connect with them, and maybe easily collab with them rather than trying to get their attention to have a collab with you. From video optimization to customizing your channel, the MCN have managers and staffs that can help you making your channel look better. They even offer workshops for you. Since these MCNs are entertainment companies, they can help you show up on their popular shows or on videos of their popular video creators. As you grow, there will be interested advertisers and there are times that if there are advertisers who contact them and looking for someone they might just pass an opportunity to you. The 2 huge MCN here in the Philippines offered stuff that are appealing, the 2nd one actually offered that I can go along with this celebrity for their show as they travel around - did not go into detail if they’ll be paying for my trip and if even I’ll be appearing on her show. The first MCN here in the Philippines that approached me actually did not offer something more personalize for me, unlike the second one who did really check my channel and see what they can offer for me - not like “here’s a generic agreement, what we give to others”. Though both MCN offered something good, but why up to now, I did not sign up for any of them? What they have to offer for me? Basically, they all offer helping in promoting your channel, optimizing, and building your channel. They do offer workshops and exposure, but I'm a Cebu blogger and since I live in Cebu and they’re based in Manila, how can I grab the opportunity to join their workshops? They did not mention that they’ll be taking care of my trip to Manila but they did mention that I MIGHT go to Manila for them at least once a year. To be honest, I am only after the workshop, but the question is how can I join the workshop? I have no problem on sharing 30% of my ad earnings or 40% of it, as long as what I share with them is worth it. I know my earnings is not much as of now but as I grow, they grow. Some vloggers earn $500-$1000 on 1 video, and I love doing what I do and I try to create more videos in a month if I could. They help you or not, for the length of your contract they’ll be earning. I’ve heard and talked to a number of video creators asking about it, and they said they don’t want to make more videos because the MCN keeps on making money while they don’t see any help from them. This is actually the deal breaker, I personally asked them how many workshops they can guarantee, the other I asked if how they can guarantee I’ll be on that show and what I hear from them? SILENCE of awkwardness. You see, you’ll be guaranteeing that you’ll be exclusively working with them for the period of your contract, you’ll guarantee that you’ll follow rules, and share your income. But they don’t guarantee what they’ll do for you. Sure they offer you workshops, helping you on your channel, promote your channel, MAYBE have you on a show, but can they GUARANTEE IT? Maybe once a year at least? Optimizing the videos, optimizing my YouTube channel, ranking my videos, those i can do it. Heck! I’m a SEO specialist, I promote and market clients online, I rank websites, I even rank videos, I optimize websites, why not this? So that’s why I am only after for workshops and exposure on their network. But since they’re based in Manila and I’m in Cebu, they could’ve at least offer to help me in improving the quality my videos through providing my video equipment or at least a camera - that’s my biggest issue at the moment, I don’t have a good camera. A number of my subscribers complain about my GoPro setup and I know I could do more and great with a better camera. I was actually thinking of ignoring all these reasons why I should not join a MCN but I realize I have someone who can consult this about, if I get lucky to get a response from her. So I tweeted to the #VLOGBOSS, Amy Schmittauer and ask her if someone like me should join a MCN and here’s what she replied. usually not recommended. Depends on what they're offering you and what you want. I was right, I am actually right. It all depend on what they offer. And since I’m not that happy with what they offer, I shouldn’t be joining in. A number of video creators out there are popular, have been around for years without a MCN, so if I’m not attracted at all, I shouldn’t join in. But don’t get me wrong, I do think that a MCN can help you but it will all then depend of what they can offer you and how much effort they can GUARANTEE to give you. But do I recommend it? Well, basing on what they offer and the contracts I've read so far, I also don't recommend it. It's just so one sided, you keep on making videos, they continue making money from you, without a 100% guarantee that they'll help you. Plus, do you know what you can learn from them you can learn on YouTube Academy and through other YouTubers?